After a two-day orbital chase, a Russian Soyuz spacecraft docked with the International Space Station Friday, bringing three fresh crew members to the lab complex and boosting its full-time crew back to six. 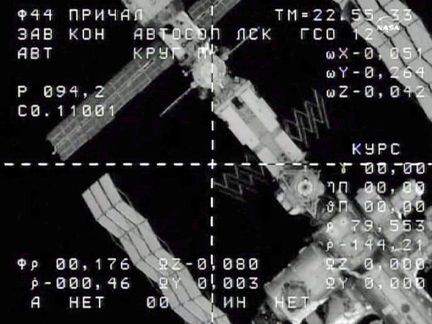 With rookie commander Dimitry "Dima" Kondratyev at the controls, flanked by Italian astronaut Paolo Nespoli to his left and NASA astronaut Catherine "Cady" Coleman to his right, the Soyuz TMA-20 spacecraft glided to a smooth docking with the station's Rassvet mini-research module at 3:11 p.m. EST (GMT-5) as the two vehicles sailed 224 miles above Western Africa. A few moments later, after residual motion damped out, hooks and latches engaged to pull the Soyuz firmly into place for extensive leak checks. Thee hours later, at 6:02 p.m., hatches were opened and Expedition 26 commander Scott Kelly, Alexander Kaleri and Oleg Skripochka, launched Oct. 7, welcomed their new crewmates aboard. Gathering in the Zvezda command module, the Expedition 26 crew took a few moments to chat with dignitaries and family members at the Russian mission control center near Moscow. "Hi, Mom, it's Jamey," Coleman's 10-year-old son radioed. "I miss you a lot, and I'll take care of Dad." "I know you will, I miss you too," Coleman replied from orbit. "I wish you could have come up in the Soyuz with us. It was really pretty amazing to look down and see the Earth. And now we're in the space station and I almost got lost on my way to this place from the Soyuz. It's so big here!" 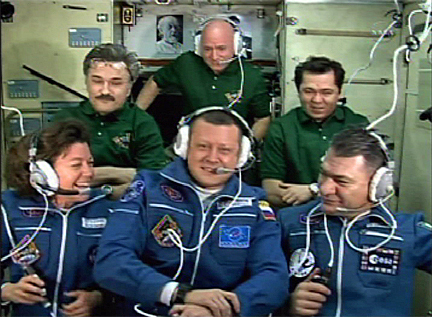 "We are so glad you're on the space station," Coleman's husband, Josh Simpson, called. "For the last three years, we have been trying to figure out where you are, whether it's in Germany, or Moscow, or Star City, or Japan, or Canada, or Texas. And now, we know exactly where you are! We can find out at any moment precisely where you are. And you're only, I don't know, 200 miles away. So you seem close to us now. Our hearts are with you." "I love you guys," Coleman replied. "And we won't have to even figure out time zones. It'll be the same time zone for six months." Veteran cosmonaut Sergei Krikalev, who now runs the Gagarin Cosmonaut Training Center in Star City near Moscow, urged the crew to "enjoy your flight. I envy you. 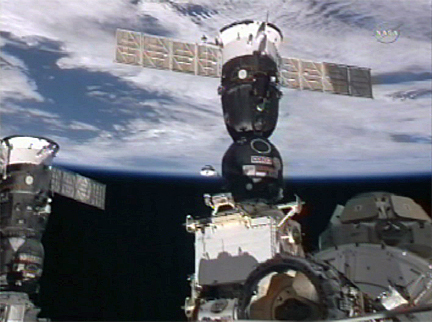 Congratulations on the successful docking and I wish you every success. Good luck to you." The crew faced a light weekend schedule, giving the new arrivals a chance to get familiar with the station's layout and operation. "As soon as they get on board, my primary goal is to get them acclimated to the environment and get them comfortable enough to where they can work up here efficiently," Kelly said in a recent media interview. "One of the first things we do is a safety briefing, make sure they're aware and reminded of all the safety training they've had, but see it from the perspective of being on board here. Really, just to get them comfortable and ready to work starting the following Monday." The Expedition 26 crew faces a busy schedule in January and February with the planned arrival of Russian, European and Japanese cargo ships, along with a visit by the shuttle Discovery. "I want to congratulate you on a super launch and docking," called Kirk Shireman, deputy manager of the space station program at the Johnson Space Center in Houston. "You guys look great, it's great to see you on board that big space station. You guys have fun. We'll be sending lots of vehicles your way very shortly."